MM's Kitchen Bites: Butter Garlic Pepper Prawns...the follies of the young know-it-all!!! Butter Garlic Pepper Prawns...the follies of the young know-it-all!!! Butter Garlic Pepper Prawns…the first prawn dish that I ever cooked quite a few years back…and was so afraid of overcooking the prawns that I served them still raw! !...and not just once, but a few times J…and every time insisted that they were cooked and that people eating it had no clue and needed to get their heads examined!! !...well now I know better…now I have eaten and cooked so many prawns that I had even once dreamt that I was jailed because I had singlehandedly managed to put the little critters on the endangered species list!! L …that’s saying a lot for someone who had exclaimed “this tastes just like chicken” when eating prawns for the first time ever back in school days…tch tch, the follies of the young know-it-all! !...the pic is of the handful of medium-sized prawns that I managed to sneak off to the terrace for the daylight picture out of the 2 kgs that I cooked on Friday evening for friends...and before you ask, no one needs to get their head examined anymore!! Wash and clean the prawns. Pat dry and put them in a bowl. Sprinkle cornflour on the prawns and keep them aside for 15-20 minutes. Just before cooking, wash the cornflour off the prawns and pat dry. Heat butter & oil in a large flat pan. Add chopped garlic and sauté till it just about starts to turn golden brown at the edges. Add prawns, black pepper , Tabasco sauce and salt. Stir and cook for 4-5 minutes without the lid till prawns turn pink. Add a little more oil, butter, a few dried or fresh herbs; mix in freshly cooked spaghetti and Voila!!! a quick meal taken care of !! When it comes to cooking prawns,i am still an amateur especially the cleaning proces..:)Yours look perfect and delish!! This looks soo colourful and nice!! Chili Garlic Fish...pretty pretty hot hot!!! Ginger Chicken...when the heat strikes!!! Rogan Josh/ Lamb in red gravy (Kahmiri Pandit style)…Colour me Red!!! Keema pasta...the "well cooked" Indian style!! Sojne Data-r Chorchori/Drumsticks cooked with mustard and poppy seed paste...still in season?? Bengali Masoor Dal....total comfort food even for a 6% Bong!!! Asian Style Roasted Potatoes...don't wonder, plate up!! Meen Molee/Fish Molee/Kerala style fish curry cooked with coconut milk ...Annie's Song!!! Chocolate Chip Muffins...getting my mojo back? 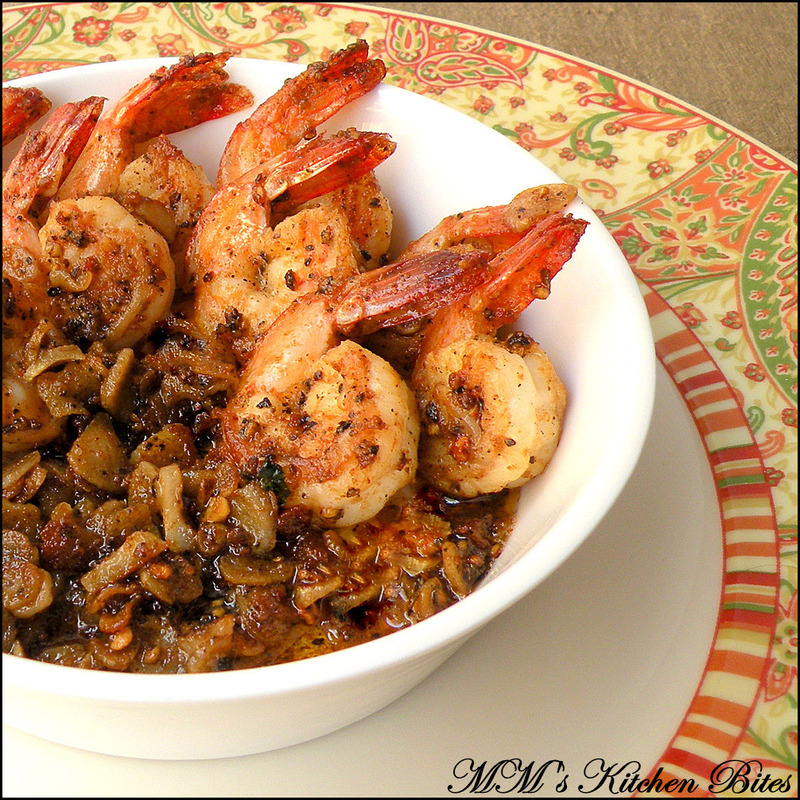 Chingri Malaikari/Prawns cooked in Coconut Milk…a match made in Prawn Heaven!!! Bhaja Muger Dal/ Bengali Roasted Mung (Moong) Lentils...lunch is served!! Stir Fried Chicken in Chilli Bean Sauce...not just chocolate!! Copyright © 2012 - MM's Kitchen Bites. All rights reserved.. Ethereal theme. Powered by Blogger.